Part 2: How to fix my credit score (FICO)? 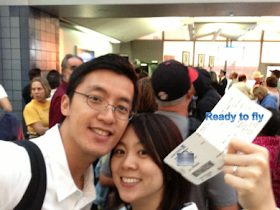 Part 3: What are the best credit cards for Beginners interested in free travel? Part 4: What is the difference between an Authorized Card User and an Joint Account Holder? My first miles-reward card was Chase Sapphire Preferred Visa card. Filled with uncertainty about impact on my credit score, I kept postponing to apply. I had questions. The bonuses will be given a few weeks after the minimum requirements are met. 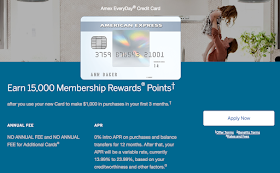 The eligibility and minimum spending requirements vary among credit card companies, but stated explicitly in the credit card bonus offer landing page or post-mails. Most cards waive first-year membership fee. I apply only those credit cards issued by well-known companies. Applying for a new credit card, whether approved or not, lowers credit score by 10-15 points per card. If my FICO score is 780, a drop of 15 points is alright. The 15 points will be recovered after six months. However, it is important to keep FICO score to be above 750 to remain in the excellent credit category for lowest mortgage rate. If there will be no need for house mortgage refinance, keep yours above-710. A credit card company would submit the card application to Experian, Equifax or TransUnion which are three well-known largest consumer reporting companies in US. I restrict myself to apply in 3 different days per year. see my "Rules of Thumb" below. A low mortgage interest carries predictable and guaranteed long-term savings in mortgage payment. FICO above 750 is a key factor to determine eligibility for lowest mortgage interest rate offered by major US banks. If FICO score is not well-above 750, I recommend not apply for new credit cards starting 6 months before the planned date of refinance. Agree. There is no free lunch. If you like management, math and want to spend only little time (one hour per week) for free travel planning regardless of your income, you will have fun. This credit card game also requires at least good FICO score and stable income. If your schedule is extremely busy and FICO score is above 740, I would recommend apply only Chase Sapphire Preferred Visa card to enjoy the 40000 Ultimate reward points. #5. These bonus points will not have much impact on my travel expense. No. It depends on the traveler's perspective and travel budget. The bonus points will not make me rich; it will only make expensive travel hilariously more affordable through miles/points redemption. In 2012, spending requirement sometimes was just one transaction, now is the typical $1000 for three months. The hefty sign-up bonuses are virtually non-existent in Asia. I guess most Asians like math. The credit card company makes money from money transactions. The card reward system is an effective channel to introduce quality company offerings to a card holder, and thus to encourage the holder to spend more. For example, the diverse yet attractive convenience and benefits of Chase Sapphire Preferred may dwarf the annual $95 membership fee. If you don't want to pay the fee 2nd year, just call the card company to cancel the card before the first year is up. It is simple. Apply all credit cards on the same time, preferably during lunch time, because US East Coast and West Coast differ by 3 hours. Not sure which clock the credit report agency follows. Apply maximum 4 credit cards each day, twice a year. Do not spend the money for the sake of meeting the minimum spending requirements. I was able to refinance my house with 3.375% 30 years FIXED loan with no point no closing cost in October 2012. I did not apply any credit cards from early July through December 2012, until escrow was closed. The wait was half-voluntary; one card card application was rejected in June due to "too many credit requests". Also, any credit card application activities during the refinance application period would trigger the lender to request written explanations from the borrow, delaying the final loan completion date.